Whether you are building, operating or just buying a water filter, filtration is an essential part of most water treatment processes. Filtration is used in the counter top/faucet filter all the way up to municipal water treatment facilities serving tens of millions of people. Even in emergency and survival situations filtering with a shirt or other cloth is often the first thing recommended for water treatment. A shirt isn’t adequate on its own by a long shot, but it is better than un-filtered/untreated water. Used in conjunction with other water treatment steps, filtration makes the rest of the disinfection process significantly easier and cheaper. 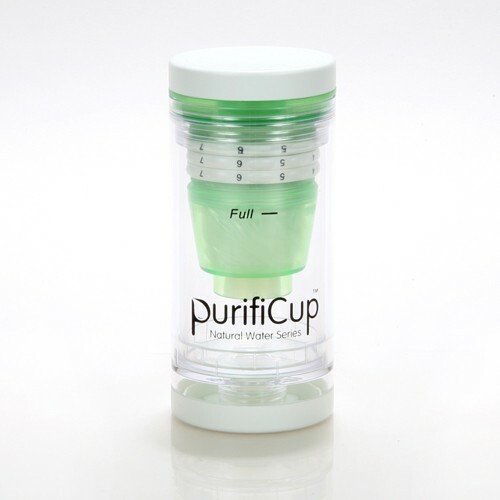 We filter water primarily as part of the disinfection of water. Disinfection is the inactivation and removal of pathogenic organisms. Filtration is part of the removal portion of disinfection. (The other part being settling or clarification). 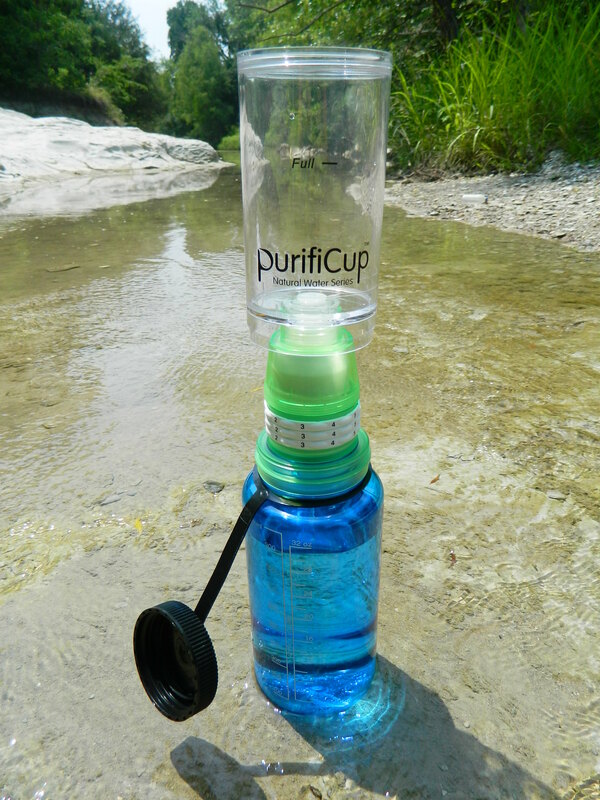 Filters work to physically remove contaminants from the water. They do this by passing the water through a filter media. The media presents a barrier to solids in the water. They literally collide into each other and become trapped. The media can be made of almost anything. As long as it has the ability to let water through and preventing solids from passing through. The pore size (size of space between the media) dictates the performance of a filter. The smaller the pore size the more that gets removed from the water. That sounds like smaller is better, but small pore sizes reduce the rate you can filter water and the total volume of water you can filter. It is always a trade off between ability to remove contaminants from the water and the ability to filter larger volumes of water. Below is a diagram of pore sizes and which contaminants can be removed at a given pore size. Filters with smaller pore sizes tend to be more expensive. They require precise manufacturing techniques and maintenance. This trade off lead to the development of chemically assisted filtration. The filter media and the water itself is treated with chemicals. The water is treated with chemicals to make the particles in the water larger called floc (large groups of particles stuck together). At the same time the filter media is treated with a chemical to make the media attract and trap the particles in the water. Most chemically assisted media, has a electro-static charge opposite the one in the floc. Typically the media has a positive charge and the floc has a negative charge. Now instead of waiting for the particles to collide with the filter media, the floc is attracted onto the surface of the media (adsorbtion) and into the filter media itself (absorbtion). These types of filter media are said to be activated. 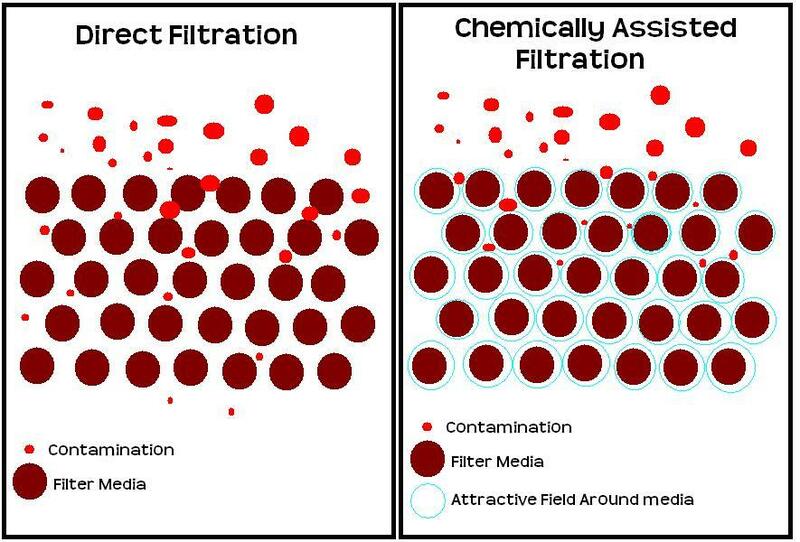 Below is a diagram outlining the difference between straight filtration and chemically assisted filtration.